Aboriginal Students Health Sciences Elder in Residence Bertha Skye talks about various Indigenous medicines and cultural practices. This episode looks at the Rat Root. Teton-Dakota warriors chewed the root to a paste, which are rubbed in their faces. It is believed to prevent the excitement and fear when facing an enemy. People Potawatomi powder of the dried root and this placed in the nose to cure colds. Sweet flag, known as “Root Rat” is one of the drugs most widely and frequently used herbal between the Chipewyan people. For the people Penobscot this was a very important result. One story was a disease that afflicts people. A muskrat spirit came to a man in a dream, telling him that he (muskrat) was a root and where to find it. The man woke up, found the root, and made a medicine that cures the people. In the houses of Penobscot, pieces of dried root bind together and hung for conservation. Steaming whole house was thought to “kill” the disease. While traveling, a piece of root remained and chewed to ward off the disease. Responses to "Cree Elder talks about how the natives used the Rat Root to cure diseases"
Ononóron as sweetflag is called in Mohawk was and is an all round medicine that we still use today in our traditional medicines list of medicine plants. It was used for colds, fevers, ailments of the heart and also as a protection medicine against unwanted spiritual activity. Many people carry this medicine in small pouches around their neck and even place some in each house window. It could either be chewed as it is or ground down into a powder and made into a tea. This sounds like the same qualities as skoy duck, it is found in moist areas by streams and rivers and the root is made into tea or bitten, it is bitter as well and works very well for colds , pneumonia, sinus infections and related illnesses. Thank you for sharing your knowledge. My late grandmother, who was a Shaman/Medicine Woman, taught us much. It is good to have a refresher teaching. 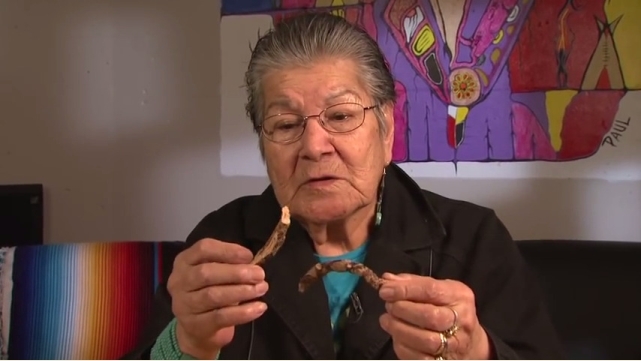 Given rat root by a chipewyan prairie dene Grandmother, Nancy, at Standing Rock. It's really amazing and worked wonders on the DAPL cough and other colds that were going around. Rat root grows along river banks, it likes "wet feet". Often grows in same environment as bull rushes. Look for photos of Sweet Flag to identify ratroot/distinguish it from bullrush. You are digging for the root tubers that grow horizontally from the plant and from which many, many thin roots grow straight down. No preparation other than taking off the small roots, cleaning and hanging to dry is needed. Because they are often found near a river, creek, etc. make sure that water source isn't polluted (industry/farming run-off) as the roots could take in some of the contamination. Weekay is a respected traditional Native medicine, for which Native people usually will make an offering of asema (tobacco) to the spirit of that plant for permission to harvest it, and to tell the plant the reason it is being harvested (planned use).